Patricia Bush Tippie, a 1956 Allegheny graduate, and her husband, Henry B. Tippie, provided the vision and funding to restore Cochran Hall and transform it into an alumni center. A College trustee since 1992, Mrs. Tippie says the new alumni center will serve as a means to reach out to Allegheny’s thousands of alumni. “I am happy that we finally have an alumni center – a home for alumni – like so many other colleges,” she says. “And I think that Sarah Cochran would be very happy that we have restored her building to its original beauty.” The Tippies express the hope that the center will draw alumni into a more active role in the College. A native of New Castle, Pa., Mrs. Tippie is currently vice president and secretary of Tippie Services, Inc. Mr. Tippie grew up on a farm near Belle Plaine, Iowa, and graduated from the University of Iowa in 1949. He is chairman of the board of Tippie Services, Inc., and serves on the boards of several other corporations and organizations. 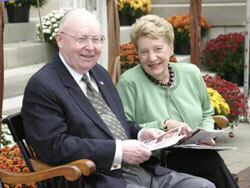 Mr. Tippie has been a long-time supporter of higher education, including his alma mater, the University of Iowa. The business school at Iowa is named in his honor. Previously, the Tippies endowed a scholarship fund for Allegheny that currently supports several Tippie scholars. They also endowed the Tippie Chair, which recognizes a distinguished faculty member, and made contributions to support science facilities and the Wise Sport and Fitness Center. In addition, they have provided funds for a permanent endowment to maintain Cochran Hall for generations to come. This will be combined with funds left by Sarah Cochran for the same purpose.